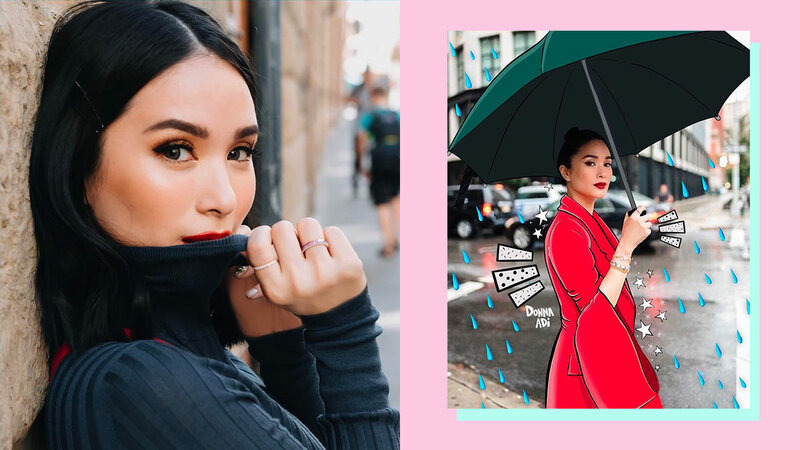 It turns out Heart Evangelista's Pinoy fans aren't the only ones mesmerized by her outfits on the daily! She recently caught the attention of LA-based artist, Donna Adi, who illustrated Heart's Prabal Gurung pantsuit over an ~*actual*~ photo of Heart! How creative is that? Heart then reposted Donna's work on her own IG and wrote, "Doodled on by the talented @donna_adi! Thank you so much for this amazing work!" When we reached out to Donna, we found out exactly how she was able to discover Heart—through her own assistant! "My assistant shared her page with me. The first thing is her impeccable style, grace, and beauty. She's also an artist and art lover which made me like her that much more!" Donna shared, through email. "I fell in love with her photos and persona so we reached out to her. It turns out that Heart is a fan of my art too so it was a perfect fit for us to do something together!" If you've been digging what you've just seen from Donna so far, you'll definitely love the illustrations she's done on photos of The Kardashian sisters (Kim, Kylie, and Kendall, respectively) as well as on Bella Hadid and Gigi Hadid! Oh, and she illustrated pretty bangin' outfits on Selena Gomez and Victoria Beckham, too! Having worked in the fashion industry for 10 years, Donna has worked on brands such as Michael Kors, Dior, and Ralph Lauren. Heart isn't her only well-known fan, either! Gigi, Olivia Culpo, and Victoria's Secret model Elsa Hosk have acknowledged her work as well. We can't wait to check out what she'll be up to next!